Osteochondritis Dissecans is a condition where loose fragments of bone and cartilage break off the end of a bone when the blood supply to the bone is reduced. It most commonly affects the knee (75% of cases) but can also affect the elbow, ankle, shoulder, hand, wrist or hip. The most common symptoms of Osteochondritis Dissecans are pain, locking, clunking, weakness, stiffness and swelling. Osteochondritis usually affects people between the ages of 10-20 years and is three times more common in men than women. It tends to develop in people who do repetitive actions that involve lots of knee movement such as jumping. Here we will look at how the condition develops including the causes, symptoms, diagnosis and best treatment options for it. Osteochondritis Dissecans (OCD) is a condition that develops due to a lack of blood supply to the end of bones (subchondral bone) which starves the bone of vital nutrients. As a result of the decreased blood flow, bone starts to degenerate (avascular necrosis) which causes thin layers of bone and the surrounding cartilage to come loose and break off from the rest of the bone. This most commonly occurs by repeated microtrauma – small, repetitive episodes of minor unrecognizable injury causing damage the end of the bone. This usually happens due to overuse e.g. in sport with lots of jumping or rapid changes in direction. There is also a genetic link in about 10% of cases of Osteochondritis so it can be considered a genetic disorder. If the fragment stays put, it will often heal by itself with few or no symptoms. However, the fragment can come loose and move around in the joint causing pain and restricting movement. If this happens, surgery may be required. 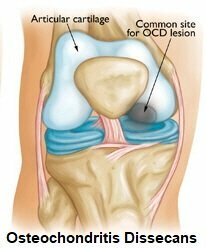 Osteochondritis Dissecans most commonly happens at the knee accounting for 75% of all cases. 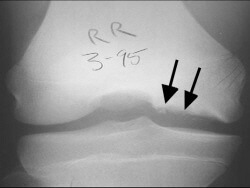 80% of knee lesions occur on the medial side of the knee (inner side) as it takes more weight than the outer side. The next most common sites for Osteochondritis are the ankle and elbow, and very occasionally it develops in the shoulder, hand, wrist or hip. It can be bilateral (affects both left and right side) in 20-30% of cases, and sometimes it affects more than one joint at the same time. It is a rare disease with approximately 3-6 cases per 10,000 people. 1) Pain: this is the most common symptom and tends to be triggered by activities such as stairs, sports and any twisting movements. It tends to develop gradually and is a vague, achy pain, but people sometimes get a sharp, stabbing pain if the loose fragment gets stuck. 2)	Joint Locking: the joint may get stuck in a position if the loose fragment gets stuck. You might have to wiggle your leg to move the fragment before you can then straighten the knee. 6)	Clunking: There may be a painful “clunk” when bending or straightening the knee. This usually happens when the outer side (lateral) of the knee is affected. 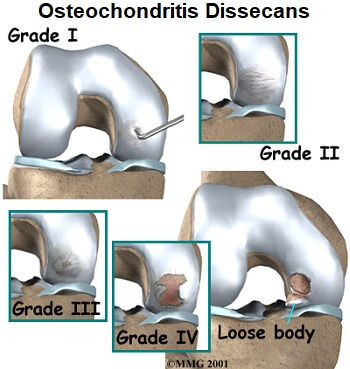 There are four stages of Osteochondritis Dissecans which can be seen on an MRI scan. Stage 1: Thickening of the articular cartilage and flattening of the subchondral bone. Stable. 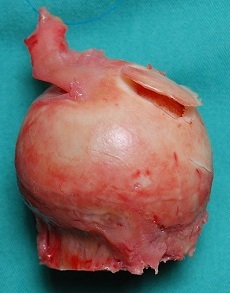 Stage 2: Subchondral cyst present and/or incomplete separation of a fragment. Stable. Stage 3: Incomplete separation with fluid around the undisplaced fragment. Unstable. Stage 4: Complete separation with a loose body. Unstable. 1) Rest: avoid activities that stress the joint such as sports for 6-12 weeks to allows the bone to heal. Crutches may be required. 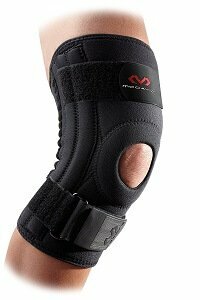 2) Knee Braces: can be worn to help support the knee and reduce the pressure going through the joint. Usually an Advanced Knee Brace or Elite Brace will be of most benefit as they provide the right level of support to allow healing to occur. 3)	Physical Therapy: to strengthen and stretch the joint without aggravating the condition – see the knee strengthening exercises section. Children and young adults tend to respond best to these treatments as their bones and cartilage are much better at regenerating. 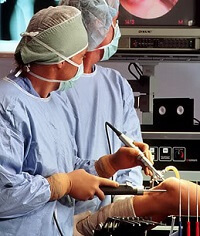 Most adults with Osteochondritis Dissecans will require surgery. If conservative treatment has failed, or if the disease has progressed to stage 3 or 4, surgery is usually required. This is usually done arthroscopically (keyhole surgery). Fragments and loose bodies are removed and the surface is scrapped or drilled to encourage the formation of new cartilage. Unstable lesions will be fixed back into place with pins or screws which also stimulates a fresh blood supply to the area aiding healing. Following surgery, pain and swelling can be controlled with Ice and medication. It is very important to follow your rehab programme which may initially restrict how much you can use your knee. Physical therapy can then be commenced with strengthening and stretching exercises to improve the stability and flexibility of the knee. Knee Braces are particularly useful after surgery to help the knee to help protect the knee and allow it to heal. Osteochondritis Dissecans is extremely rare. If this isn’t sounding quite like your knee pain, visit the common knee conditions section to find out about other common causes of knee pain or visit the knee pain diagnosis section for help working out what is causing your knee pain.